Home Uncategorized When does Shimla receive snowfall? Shimla, the capital city of Himachal Pradesh, was built and designed during the colonial era. The destination is a tourist spot and makes it favourable for visitors to attend the place throughout the year. Most preferably people wish to visit the destination to escape from the scorching summer heat and get indulged in a relaxed environment. Usually, the city receives snowfall in Mid-December to January. Since 2018 the city has started witnessing snowfall since October. The moment there is a snowfall, tourists from all over flock in to witness the beauty of the town. It is a source of excitement to people when they spot the city blanketed with layers of snow. 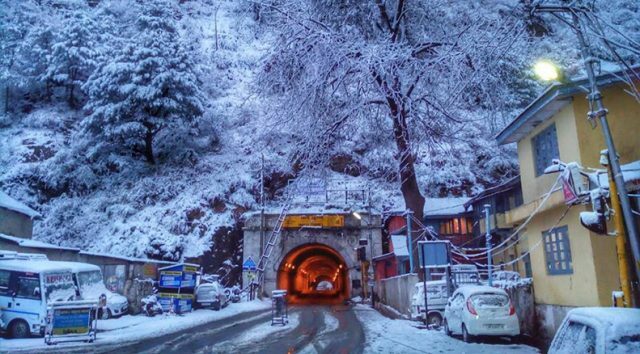 The temperature level and climate faced in Shimla can vary according to the snow. Usually, the temperature drops down when the freezing winds start blowing throughout the season. The temperature fluctuates between 0-10 degree Celsius. o Mall Road – This is a tourist spot which promotes the culture and heritage of the city. o Tara Devi Temple – It is a renowned religious place. The location is this temple is a 20-minute drive from the Kalka-Shimla highway. People who are devotees of Goddess Tara travel to this temple to pay their respects. o Gaiety Heritage Cultural Complex – This architectural wonder is placed amidst the busy lanes of Mall Road. The building depicts the Victorian Gothic style like other buildings in Shimla. o Jakhoo Temple – This temple is situated on Jakhoo hill which is dedicated to the deity Hanuman. The temple attracts tourists globally who come to pay their respects to Hanuman. o Army Heritage Museum – It is a part of Annandale which is closely located near Ridge. This destination is a picnic spot where one can explore the various types of collectibles which are associated with the Indian Army. o Scandal Point – It is a significant tourist spot which is located in the westernmost tip of Shimla. It falls in between mall road and the ridge. It is among the busiest places. The location has a love story associated with it. The names involved are the Maharaja or Patiala and Bhupinder Singh, the then viceroy’s daughter. o Jakhoo Ropeway – One need not travel to Switzerland to experience the journey through a cable car. Shimla has the best to offer. A trip through the cable car will let the traveler have a glimpse of the entire city. It is always advisable to prepare yourself before traveling to a hill station during snow. Carry sufficient amount of warm clothes, dry food, and medicines. Authorities in the hill stations try their best to offer the tourists. The climate in such areas cannot be predicted. One must be prepared to witness jams caused due to snowfall and the calamities that cannot be controlled. Previous articleWhat is famous in Himachal Pradesh? Next articleWhich is the best time to visit Shimla?